Florida Keys Beaches are often said, and heck probably I've said it enough myself, are somewhat eclectic in their quality. The beaches in the Florida Keys are known for many things, from some of the greatest scuba diving you will experience anywhere in the world, to sunsets to simply die for. From fishing that is real man against beast stuff, to bars and nightclubs that never really shut. And whatever you don't forget the 80 degrees every day, live in your shorts.... weather to die for! You see due to the way that the tides flow around the island, the majority of the Florida Keys beaches that we visit, are in fact man made. They may look like sandy masterpieces, but you can do the same yourself and make your very own beach if you have enough sand. So sorry to ruin the tropical fantasy, but every couple of years tons of sand gets shipped in from the Caribbean and thrown down all over the place to make the coastlines that have the kind of look that tourists and of course islanders that rely on the dollars the tourists bring want to see. Key West in particular have spent a great deal of cash making the beaches in Key West attractive for the visitors, and they are probably as good nowadays as they have been for the last twenty of so years. Certainly the lovely white sand isn’t just good news for the tourist industry, but also good news for your feet. Whilst we are talking about tourists, but I guess it applies to everyone, there is a good website run by the Florida Department of Health that keeps an eye on the water quality throughout Florida Keys Beaches. Although you wont have a problem, I'm sure, but if you have problems with things like ear infections then it might well be worth having a quick check of the water quality before entering into the surf. Because if they didn’t make the Florida Keys beaches nice and sandy, then you would most likely be treading rather painfully over tiny bits of crushed coral. If I want to be really technical I might even tell you that, in fact they are mainly carbonate grit from the crushed skeletons of coralline algae and crustaceans. But to be so intellectual isn’t like me at all, so I won’t tell you that! The plain fact is thank god for the sand…end of story. But what the Florida Keys Beaches do have is a very distinct identity of their own, which varies from vast sandy beaches such as Bahia Honda State Park , to the tiny Library beach in Islamorada. If you want to go and experience great water sports then Smathers Beach on the island of Key West is probably as good a place to go as any. Certainly the vendors and people flocking to the area point it out as a great place to go. And who are we to disagree with the masses! So looking down at the rest of the page we have grouped our information on Florida Keys Beaches purely by area, to allow you the chance to take a closer look at what each of the beaches have to offer, before you make your way down there with your rolled up towel under you arm. So make sure you click through to the extra guide for each where you will find much more information on Florida Keys beaches from Key Largo Beaches at the top of the Keys, down to of course the sandy offerings that Key West has waiting for you. 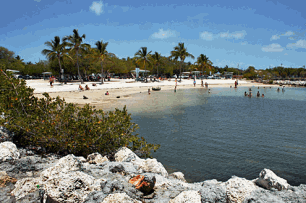 Probably the most famous of the Key Largo beaches available is a place called Harry Harris park. Certainly when I spoke to people about what they recommended this was the one at the top of their list. It isn't a natural beach but is sandy thanks to the people who ship the stuff in every year. Without a doubt the best beach in Marathon and the whole of the Florida Keys is Bahia Honda State Park. Actually I have to admit, that the beach isn't really in Marathon, as it sits down by Bine Pine Key, but it is only 12 miles away so I have added it to this guide. It has also been recognised as the best beach in the whole of the United States of America. So before you go looking through our information on Marathon Beaches definitely pay Bahia Honda a visit, and if you are feeling adventurous then get your tent out and spend the night too. In Islamorada Anne's beach is the place to go. This Florida Keys Beach is named Anne's beach after a local millionaire Anne Eaton, who spent her whole life looking after the nature and beauty of the area. There are many animals that call the Florida Keys beaches home, such as the Black Skimmer bird, Great Land crab, and even a crocodile or two. Anne Eaton died in 1992, but for a woman who unfortunately suffered polo and its after effects from the age of 25, the naming of Anne's beach is a fitting tribute to a marvellously caring woman. I'm not sure if its the most famous of the beaches on the island but it certainly is popular as it is also dog friendly. But hey enough on Key West, this section is about Islamorada after all. There are quite a few beaches in Key West, definitely more than most of the other islands in the Florida Keys. 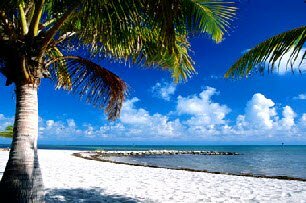 If I have a personal preference its a trip down to Smathers Beach, which is a great two mile long stretch of sand on the Key West coast. So you can run along the beach, sit and catch some rays, or even do some snorkelling as its a nice shallow beach. Perfect for a great day out for all the family, but of course the choice is up to you. And if you fancy letting your dog have a run around and splash in the surf then you will struggle to find one of the Florida Keys Beaches that will allow this, but in Key West they have a tiny little beach called.....Dog Beach funnily enough. It's tiny, but your dog will love it. So its not just Smathers that can have you grabbing your towel, as all the Key West beaches have something that might appeal like the laid back and relaxing Higgs Beach for example. So of course make sure that you check out all the detailed information that we have on all the Keys beaches, by clicking through to each of the guides for a good read. But if you are in a hurry to get your tan going and have the urge to dip your toes in the surf, then we will make it easier for you by giving you in our opinion the top five. Remember if you find any gems, or Florida Keys beaches that you think are a "Wow" and should be mentioned on this site, then drop us a line and we will add your information on to our pages. We are still finding out about tiny little hidden, or off the beaten track strips of sand and water that we still have to explore when we can.